The history of Midkemia Press is rich in irony. 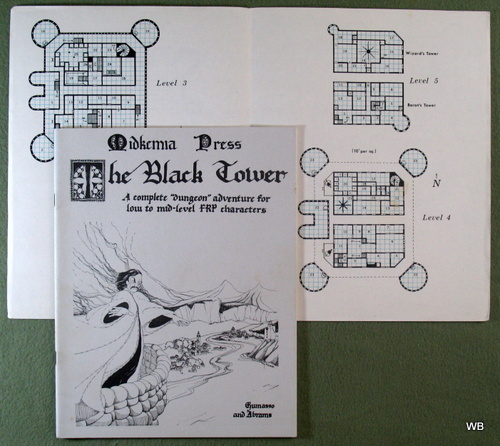 At the dawn of gaming (the mid-70's), when D&D was a growing collection of little brown books, a group of fantasy enthusiasts in the LA area developed a fantasy world called Midkemia. Lesser known names (Stephen Abrams, Jon Everson, and Conan Lamot, and others) were joined by one now very well-known name, Raymond E. 'Ray' Feist. Together, they built the world, and Feist has since written a several dozen fantasy books based on this world. 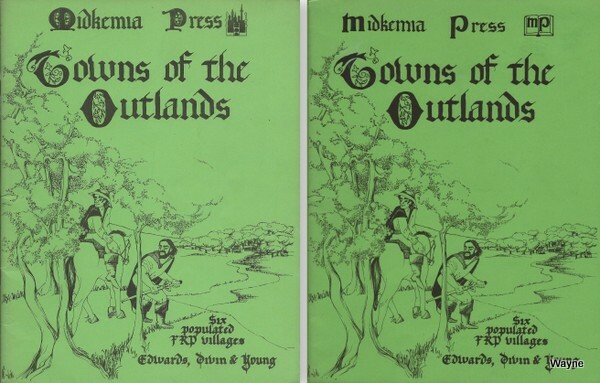 "TOWNS OF THE OUTLANDS was designed to fulfill two basic needs, the need of Gamesmasters to fill their campaigns with detailed hamlets and the need for more urban scenarios which are fully populated and adventure ready. These towns and villages can be placed into many different locations in almost any campaign and are written with optional histories and settings so they may be easily adapted to any campaign in any gaming system. They are also fully populated and indexed, with many potential adventures arising from the characters' interaction with local characters. The types of towns presented, a desert oasis, a seacoast/river smuggling cove, a northern trading center, a tribal hillfort, a woodlands roadhouse, and a mining camp were chosen to allow diversity. Several can be placed relatively close to one another, as most campaigns possess deserts, seacoasts, arctic regions, valleys, woods, and mountains. Information is provided in each individual introduction as to the locality required of each town. The characteristics of the non-player characters are given as per the Tome of Midkemia rule system (to be published possibly in summer, 1982). However, it should be relatively easy for Gamesmasters to convert these characters to any game system being employed. It is suggested the given level of each character in a town be tried first, then adjustments made if needed. Indexes are provided for all six towns. 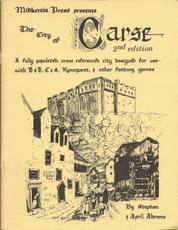 The stable levels and inn levels are as per THE CITY OF CARSE, and CITIES, published by MIDKEMIA PRESS. 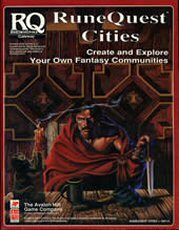 Most importantly, we hope TOWNS OF THE OUTLANDS will become a valuable part of Gamesmasters’ libraries, giving hours of entertaining gaming and providing campaigns with population centers without the need of long hours of preparation." ... Introduction by Richard A. Edwards, Wesley M. Divin & Russell Young. "Ancient and ill-fated, Castle Tulan stands as a spectral edifice surrounded by a reed-choked moat in the old town of Tulan. At night, fearful sailors on passing ships have reported strange lights flashing from the windows of the northernmost castle tower. Rumors have it a host of unholy creatures have taken up residence in the vast halls and galleries. The locals tend to be close mouthed on the subject, and when queried, turn hastily away, muttering about dangerous questions. The townspeople do not interfere with anyone foolhardy enough to visit the castle but simply shake their heads in disbelief over those so obviously bereft of their senses, and never speak of those who have tried before. Tulan Castle is now under the control of Zorasis the mighty, once magician and advisor to the East Baron of Tulan and now a dread vampire. 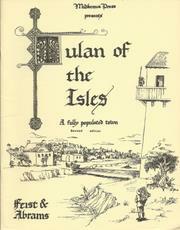 Here then is his story..."
"TULAN OF THE ISLES is a fully populated, predominantly human town, designed to be compatible with any of the currently available fantasy role playing games, including DUNGEONS & DRAGONS, CHIVALRY AND SORCERY, ARDUIN system, RUNEQUEST, DRAGONQUEST, and TUNNELS AND TROLLS, and with some modification, with such science-fiction games as TRAVELLER, and STARSHIPS AND SPACEMEN, as well as modern military role playing games like COMMANDO. 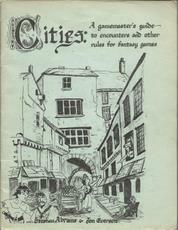 It is especially designed for optimum enjoyment when used with the CITIES rules published by Abrams and Everson (MIDKEMIA PRESS). The large PLAYERS' MAP provides a birds-eye-view of the town and the immediately surrounding countryside. The smaller map at the end of the book (p.47), provides a more extensive view of the surrounding area." An expanded version of the 1st edition, with new art, more encounters, and guidlines on personalizing the information for a referee's own campaign. "Right off the top, we recommend the Gamesmaster run no more than three, and preferably one or two, players at a time in cities. With three or more, someone is always growing bored while the Gamesmaster and some other player are haggling prices, gambling, looking for work, etc. These tables are designed to be used every ten to fifteen minutes of real time (or more often if things are lagging). "No Encounter" is built into the table to reflect the likely frequency of nothing of note occurring near or to the players' Characters in a particular area of the city. A larger number of encounters will be visual, not directly involving the Characters, unless they decide to join in. We recommend that if the players are involved in something, the Gamesmaster shouldn't interfere (too much) by throwing encounters at them. A significant number of encounters read, "...accidental bump...". This represents the jostling a Character would receive in a crowded street. This teaches players not to attack everyone on sight and keeps thieves from being quite so conspicuous. Another frequent encounter is "....recognises Character.. .mistakenly.. .correctly." This is where a non-player Character (NPC) either thinks he or she knows the Character or did in fact know him previously (even if the player doesn't "remember"). It could be an old buddy, sweetheart, rival, employer, slave, sidekick, or anyone else the Gamesmaster can think of, from somewhere in the Character's past. Or, the NPC could be mistaken, but convince the player they once knew each other. Or... As you can see, the possibilities are many..."
1) Information about the history and current social situation in the city. 2) Map enlargements of the city, delineating each building in the city. The pages following each enlarged map contain information on most buildings within that section, including descriptions of those who reside within those locations. While the majority of businesses are developed, a few have been left for the Game Master to add so that each game can be individualized. Should the Game Master not wish to do so, JONRIL is sufficiently complete to be used without modification. 3) Extended descriptions of a large number of CITY CHARACTERS (as per Character Encounters in CITIES 2nd Edition). These are individuals with whom player's characters may interact, and are brought to the player's attention by events or circumstances. PERSONAGES, are local figures of some importance and influence, such as the Commander, the Chancellor, the heads of the four major trading Houses, etc. NOTE: Characters are constructed using the Midkemian Game System. This tends to provide low-level characters by other game standards. Modification can be easily made to accommodate other systems. JONRIL: GATEWAY TO THE SUNKEN LANDS is designed to be used in conjunction with other MIDKEMIA PRESS playing aids, but can be utilized with any game system. 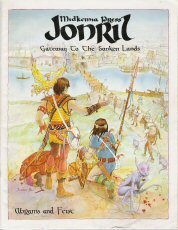 JONRIL is part of the FIRST MIDKEMIAN CAMPAIGN, and is a companion piece to HEART OF THE SUNKEN LANDS by Rudy Kraft (Available Fall, 1982), but either product can be used separately." 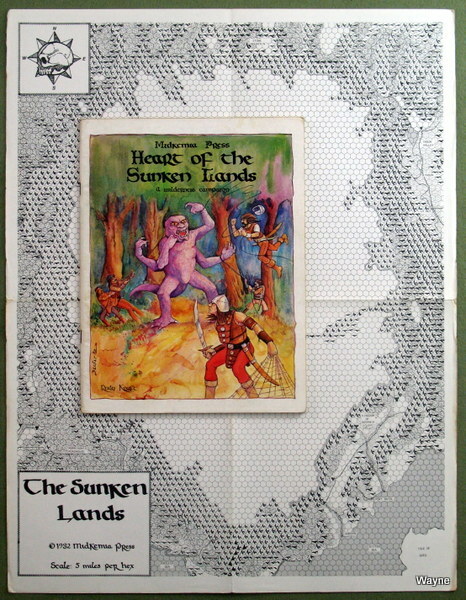 Players can travel through Midkemia's Sunken Lands in this sourcebook. A novel aspect is the large, pull-out hex grid map of the region. The border areas are drawn-in, but the interior is left to the referee to populate. 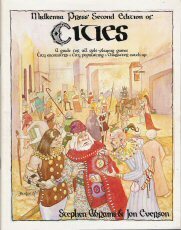 Originally "Cities," this excellent resource became one of those odd Chaosium/Avalon Hill collaborations, "Runequest Cities." (See Runequest, 3rd Edition). Other than typeset changes and subtle alterations in art, there are no significant differences between them. 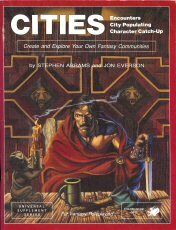 "A unique handbook of urban possibilities, Cities is designed for gamemasters using any game system. Clear instructions support more than 60 tables and dozens of sub-tables. • Get handy access to hundreds of random encounters, from wandering fools to high-level magicians; turn random meetings into the seeds of new, exciting adventures. • Realistically populate hamlets, towns, and cities, so that the logic of your communities can become part of the fun of play. • Account for what player characters do when they are not in play for longer periods of time -- you'll be surprised at what goes on when your back is turned!" 1986 ... 64 pages ... CHAO 2013 ... ISBN ?? 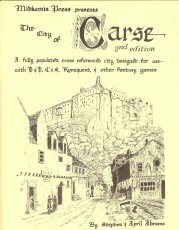 "Designed for all fantasy roleplaying systems, Carse is a home base for adventurers. 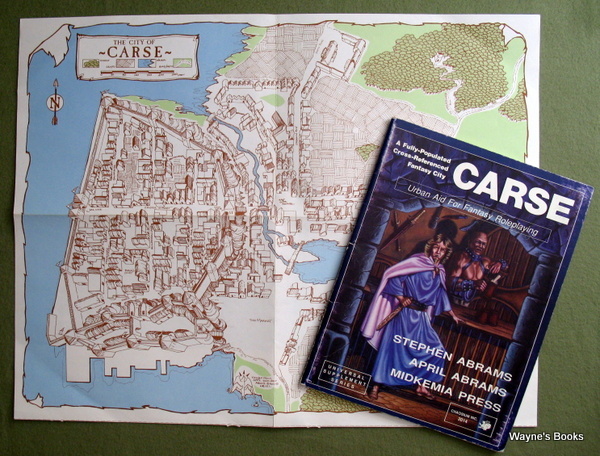 With it, gamemasters present adventures normally, using CARSE to locate shipbuilders, outfitters, armorers, inns, sorcerers, and all the other delights which player-characters demand. Nearly one hundred kinds of businesses and professions are noted; in all, about 450 buildings and four major complexes have been populated and discussed. But Carse is much more than a medieval shopping mall. A lively city-state, romantic intrigue and secret societies abound here, each with its own prescription for love or power, and each in turn shadowed or hounded by the operatives of Baron Bogardis IV, capable ruler of Carse. Gamemasters can use its sub-plots and random encounters to generate new scenarios. Lovers, thieves, thugs, loonies, and even a few honest folk strut down byways where personal schemes and family connections are all-important, yet who can say whether it is good or ill to be known by such residents as the Troons or the Hazara Khans? • Buildings coded individually and identified by function, proprietor, and hangers-out; section map and section summary list on same page. • Optional tables for food, lodging, and stable quality. • Personages section; 30 randomly-encountered characters. • 22x17-inch pull-out player map. • Carse building cross-index by business type or profession. • Bay of Carse map and schematic map of districts." "Designed for all fantasy roleplaying systems, TULAN includes complete data for a wealthy town and a farming village, and details the relation between the two settlements and the region around them. Information includes persons, places, encounters, adventures, politics, military security, economics, and a scenario. If used with CARSE, a companion volume, the gamemaster will possess the basis for a complete fantasy world. TULAN is more than just a place for the adventurers to pillage or buy items. The citizens of this rich town have a special relationship with adventurers, and commission, fund, and outfit many expeditions. The wealthier citizens collect antiques and other objects accumulated by adventurers. Many citizens are adventurers themselves! • Extensive suggestions for the gamemaster, based on what the adventurers want to do. • Very detailed information on the quality and prices of items and services offered for sale. • Realistic skills for all non-player characters, including bargaining, administrative and craft-skills as well as combat skills, as appropriate. • Carefully structured, D100-based encounter tables, including many opportunities for adventures. 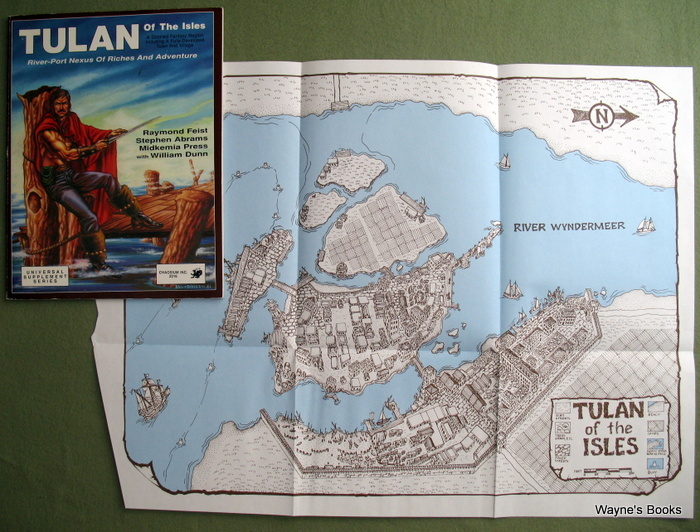 TULAN: Nexus Of Riches And Adventure"